The other shoe has dropped this morning. 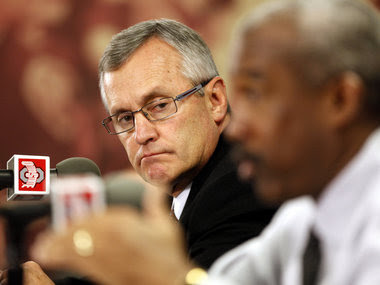 Jim Tressel has resigned from Ohio State in the wake of the cover-up scandal that seemed to me to doom him from the start. News reports will be coming from all sides, and opinions from even more. But to me, there was no other way. The old adage is that the "coverup is worse than the crime"--look at Nixon and Clinton for that proof--and that is especially true here. The actual "crimes" by Pryor and cohorts were so minor (and debatably "wrong"), but Coach Tressel knew about them, and purposefully failed to do his stated duty, to report the potential violations to the school. That is what obviously and inevitably brought the Tressel era to a close. The minute I saw this press conf, I knew it was over. Yet some in Buckeye Nation are failing to see this. Blame Pryor, blame Herron, blame Ray Small, blame the "mainstream media". But at the end of the day, you have to really be inventive to think that Jim Tressel did not deserve the fate that eventually befell him. It is beyond implausible to think that by him "reporting" what he knew to an FBI agent and to a lawyer, and NOT to the school, Coach Tressel was doing anything further than trying to protect the 2010 season, and to make sure the Buckeyes were sufficiently stocked to make another Big Ten run. The mood in Ohio has been described as "shocked" this morning. I can't believe that is true. (As I write this, Aaron Goldhammer is on ESPN saying that very thing.) A more apt description would be "saddened." Jim Tressel was a great Ohio State coach, and is a good man. But he broke the rules, and not just a little bit. And so this had to go the way it did. "Nobody is bigger than Ohio State." That's a hollow, Texas-like statement full of bravado, but also true. And the football team will certainly survive. It took a little over an hour for ESPN to link this to LeBron James in the finals. Uggh. Is that in every reporter's contract?